Make your Bulb Buying Really Count this Weekend! has affected my family and most of the people I know. 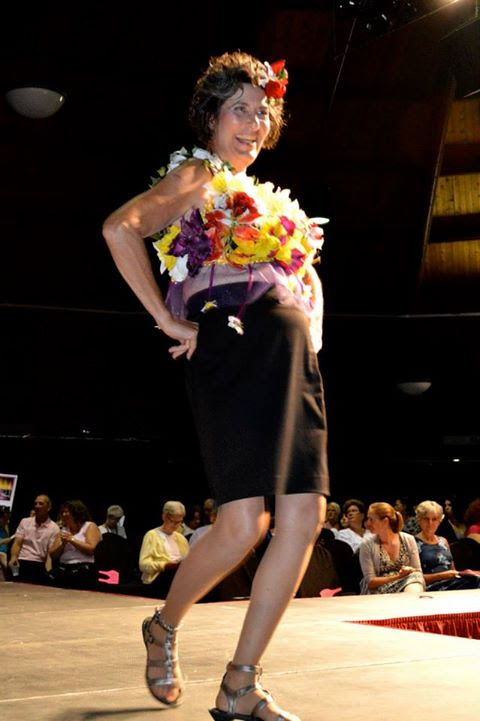 When I was 60, I even went so far as to craft and model a floral bra on the runway at the Oakdale in After the Storm’s Art Bra event- the bra I modeled sold for over $1000! So, as you can see, I am serious! I hope you can spread the word, tell your friends, come in and buy bulbs, and plant them all over your yard and your neighborhood. Why not spread the bulb love and plant some at a local school or convalescent home? Naturalize daffodils along the road, just to make your neighbors smile. Buy bulbs to pot up and store them in the cellar and give them as gifts for the winter windowsill. Bulbs are SO easy and so satisfying. 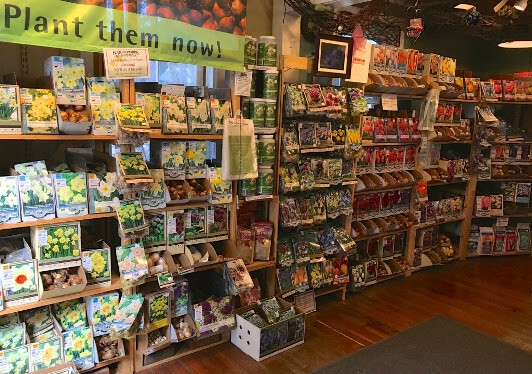 To quote a regular customer who walked out of our shop with a shopping bag filled with bulbs last Saturday: “Every spring I wish I had planted bulbs and every fall I get lazy. This year I did it! 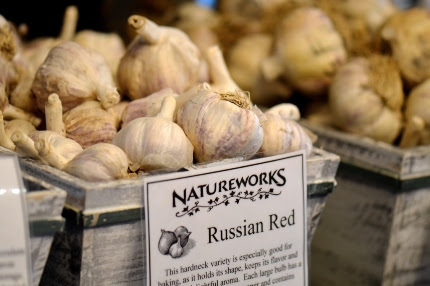 I bought the bulbs I wanted and I am going to plant them this weekend!” Yes, it is hard to express how badly you will be longing for that early color after being cooped up inside, missing your garden, for 3-4 months. So why don’t you just take my word for it and help a great cause at the same time! On Saturday morning at 10 am I am offering a FREE workshop on planting the earliest bulbs to help our native pollinators. They fly earlier and at much cooler temperatures than honeybees and they depend on these early bulbs for nectar. This is also a great way to understand the order in which our bulbs bloom. Did I mention I have a chart that illustrates this that I will be handing out at the workshop? This Saturday and Sunday from 11 am-4 pm, we will be hosting a wine tasting to benefit After the Storm. This is a new addition to our annual fundraiser weekend- see the details in the Upcoming Events listings below. 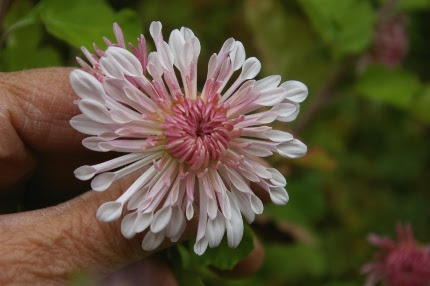 ‘Pink Cloud’ is a brand new variety of perennial mum bred by the daughter of the man who bred Global Warming mums. Great cut flower! late blooming perennials. 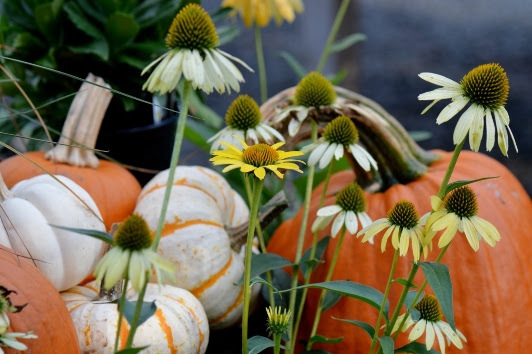 Tuesday I gave a talk to the Madison Garden Club on Amazing Fall Gardens and I had to spend a lot of time shrinking my presentation as I had so many fall plants to talk about! If that isn’t the case in your yard, come in NOW and grab some October color. On the left you will see a NEW perennial mum called ‘Pink Cloud’. It is just coming into bloom, as are so many other of our specialty perennial mum varieties that we love so much. 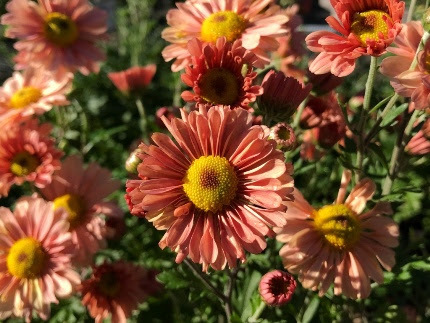 We have at least 6-8 additional varieties that are just budding up and offer the promise of armloads of cut flowers well into November. This is ‘Empress of China’, a heirloom that we grew here at Natureworks. We still have plants left. So pretty! Let us replant your hanging baskets for fall! year we have two types to choose from. ‘Early Amethyst’ is the one right outside the front door of the shop. ‘Pearl Glam’ is new this year, with deep, wine colored foliage, white August flowers that morph into the same intensely purple berries. What a contrast! One thing many of us are focusing on right now is fall decorating. 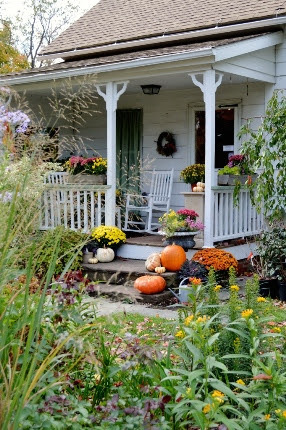 I want my porch and front yard to look festive for fall. 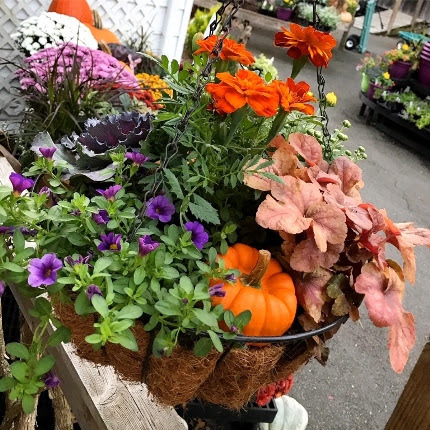 Pumpkins and gourds are a must, but why not consider bringing in your tired hanging baskets and letting us replant them for you? My staff has been doing this and they are gorgeous. I also take a few of my favorite late blooming perennial mums, Montauk daisies, grasses, asters, or berry bushes and plant them in a large urn and place it at the top of the steps. Later, all the perennials in these containers are given a permanent home in my garden in mid-November before I start cutting greens and berries for the next phase of holiday decorating. This Thursday at 4 pm. I will focus on PUMPKINSCAPING on Facebook Live. 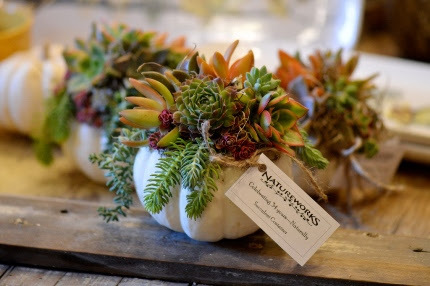 I will show you how you can incorporate all different sizes and colors of pumpkins and gourds into your containers. Have you ever stacked pumpkins into a topiary? Alternated small ornamental cabbages with small pumpkins and colorful miniature evergreens in your windowboxes? Tune in and watch live, or watch anytime afterwards: our Facebook Live videos are all archived on the Natureworks Facebook page. 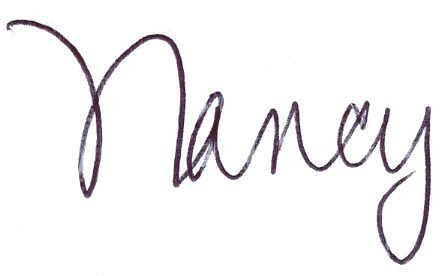 to see a short educational video that she did in case you missed the class. 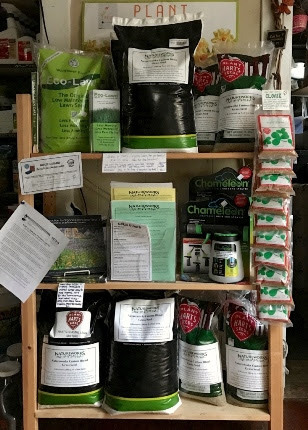 Thin and weedy areas of grass can be overseeded with grass seed and organic fertilizer. Add a light 1/4″-1/2″ layer of Coast of Maine Top Soil or Compost to areas you will be working on. Sprinkle fertilizer and grass seed onto the new soil. Top dress new seed with chopped straw to keep the seed moist and keep birds away. Water daily until seed germinates, and then every few days depending on weather. The rain was a blessing in so many ways. Now I feel much better about digging, dividing, and rearranging plants. Cooler weather with less humidity is very welcome right now. It is finally looking and feeling like fall in CT! flower arrangements this week. 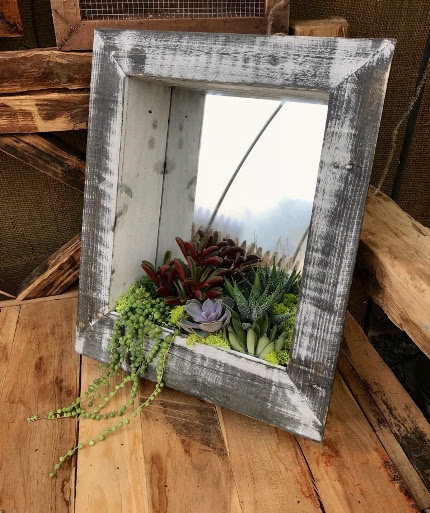 We have a few mirror boxes that Amber has planted up with succulents. We’ve got tons of little houseplants, lots of really nice containers, and the best organic potting soil so that you can tune up your houseplant collection as you begin the process of bringing it indoors for the winter. Don’t forget to download our handout The Houseplants that Came in From the Cold,CLICK HERE. It’s not that cold yet, but you want to acclimate your plants slowly to warmer, less humid air and definitely check them for insects and give them a few preventative sprays to be sure you bring any unwanted hitchhikers into the house. 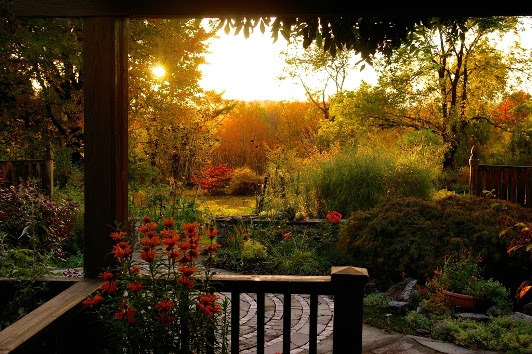 Glowing autumn sunsets, pretty fall flowers, abundant harvests that keep on coming… let’s truly enjoy this time of year. It is so special. Come in and visit this week. I hope you can participate in our Bulbs for Breast Cancer fundraiser this weekend. Let’s make a difference, let’s give back AND have beautiful spring gardens too! 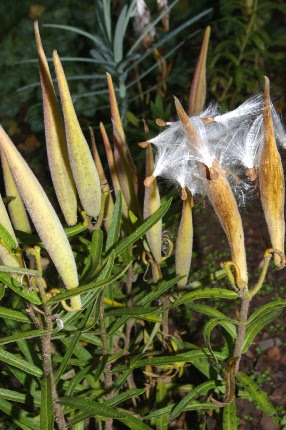 Milkweed and butterfly weed seed pods are bursting open. Plant the seeds in the ground NOW! Don’t store them over the winter. They need a winter chill period (stratification). This entry was posted in Blog, For App, Uncategorized. Bookmark the permalink. Got Bulbs? We Do! It’s TIME TO PLANT!